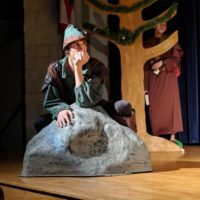 WEST LAFAYETTE – Ridgewood Drama presents “The Somewhat True Tale of Robin Hood” on Thursday, Dec. 13 at 7:30 p.m. and that morning for the senior citizens banquet at 11 a.m. 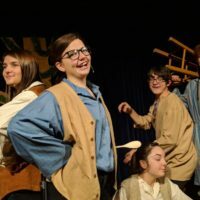 This hilarious, slapstick comedy has something for all ages! 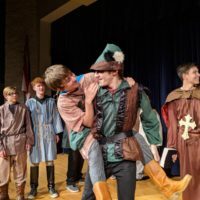 Bring the whole family out to see Robin Hood, played by junior Trevor Hawkins and his motley crew of 10 merry men and Friar Tuck, played by sophomore Daniel Scott, save the fair Lady Marian, freshman Alyssa Kusmich, and all of England from the evil Prince John, junior Ray Shaw, and the nasty Sheriff of Nottingham, junior Blayden McCoy. Robin soon finds out that it sure is hard to be humble when you’re a swashbuckling, egocentric super-hero. 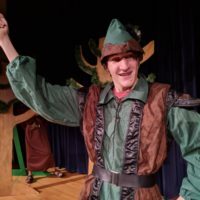 But our gallant guy-in-green tries his best as he swaggers through “The Somewhat True Tale of Robin Hood”, a frantically funny, Monty Pythonesque retelling of the classic. 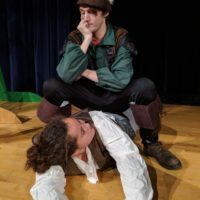 This time around, the legendary legend, in his never-ending quest to aid the needy, encounters a lovely damsel-in-distress, an ever-scheming sheriff who would rather bowl a strike than hit a bull’s-eye, a gold-hoarding, bad-guy monarch wannabe, and a good-natured Town’s Guy, senior Waverly Reidenbach, and the Technical Director, junior Josh Schumaker, who manage to make their way into every scene, whether they belong there or not. 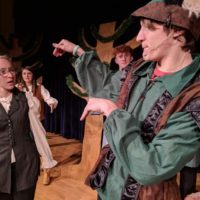 Combine them with a band of uproarious, spoon-wielding merry men and join us for an irreverent jaunt through Sherwood Forest that you won’t soon forget! Summary adapted from www.dramaticpublishing.com. 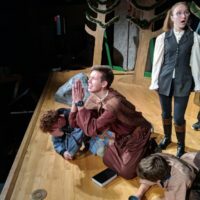 For the evening performance, admission is $5 at the door.